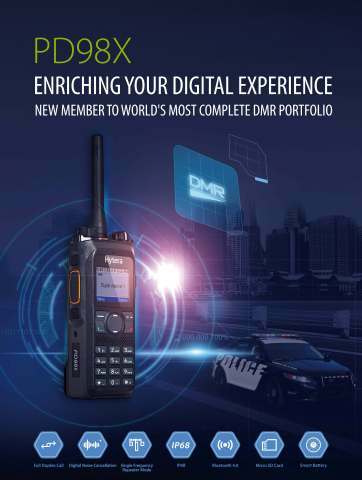 Hytera, a world leading solution provider of Professional Mobile Radio communications, has launched its latest DMR (Digital Mobile Radio) handheld PD98X, adding another strong member to its top-notch DMR portfolio. PD98X offers an exceptional audio experience through noise cancellation technology, while boasting new features including full duplex calls, recording capability via Micro SD, Bluetooth 4.0 for audio or data and single frequency repeater mode to increase coverage. “We are proud to announce the launch of PD98X,” said G.S. Kok, Senior Vice President of Hytera. “A series of cutting-edge innovations and designs have been added into this new model to make it a full-featured radio to satisfy customers' increasing demand for functionality and user experience." The addition of the PD985 positions Hytera with the most complete DMR radio portfolio to meet diversified requirements, from simple, reliable and cost-effective handsets (PD3 and PD4 series) to rugged and feature-rich solutions (PD5 and PD6 series), up to the high-end, professional system radios (PD7, PD9 and X1 series). The whole portfolio offers display and non-display, GPS and non-GPS, UHF and VHF versions, allowing customers to select the best handset for their daily operation and mission-critical scenarios. PD98X enables frontline personnel to make telephony calls between other PD98X and telephones or mobile phones. Based on interference cancellation technology, PD98X is able to use one slot to receive a signal and another to transmit it in the same frequency using DMO mode to extend the communication distance. With integrated Bluetooth 4.0, PD98X supports both audio transmit and programming via Bluetooth. Maximum 2.5W output speaker and new noise cancelling technology ensure clear and loud voice communication. PD98X complies with the highest dust and waterproof standards, to confront the harshest environments. The radio continues to function after submersion down to 2 meters for up to 4 hours. This feature makes it easier to monitor the battery status, such as battery life time and charging time, reducing charging time dramatically. PD98X supports up to a 32GB Micro SD card, to record up to 576 hours digital/analog audio. Hytera Communications Corp., Ltd. (SHE: 002583) is a world leading solution provider of professional mobile radio communications. It offers complete and customized communication solutions to government, public security, utility, transportation, enterprise and businesses. Founded in 1993 in Shenzhen, China, Hytera is a key player in the PMR (Professional Mobile Radio) communication industry with a large customer base in more than 120 countries and regions across the world. For more information, please visit www.hytera.com.